"Spinach salad with blue cheese, walnuts, and dried cranberries. If you can't find walnut oil, olive oil may be substituted." Preheat oven to 375 degrees F (190 degrees C). Arrange walnuts in a single layer on a baking sheet. Toast in oven for 5 minutes, or until nuts begin to brown. 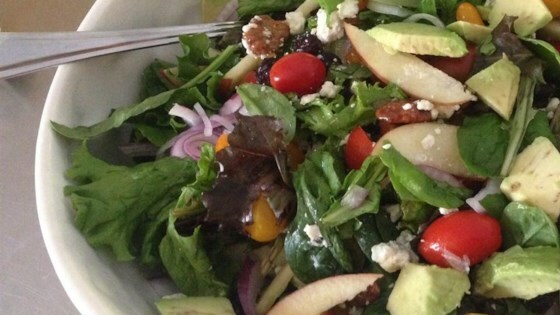 In a large bowl, toss together the spinach, walnuts, cranberries, blue cheese, tomatoes, avocado, and red onion. In a small bowl, whisk together jam, vinegar, walnut oil, pepper, and salt. Pour over the salad just before serving, and toss to coat. I substituted olive oil for the walnut oil-tasted great.